The Canucks goalie had his first matchup in years with old friend Tim Thomas and … well, at least he hasn’t lost his sense of humor. Marquee free agent David Clarkson finally scored his first goal of the season, and Leaf fans are handling the event with their typical brand of quiet restraint. Do me a favor and let me know how many times you can watch this GIF before it stops being funny. I’ve had it running for three straight days and I’m not there yet. Recognizing the one NHL team from around the league that worked the hardest to make sure anything that might have been fun for its fans was quickly destroyed. Hey, remember that Blackhawks fan who stole Jets forward Adam Pardy’s helmet a few weeks ago? On Thursday night in Winnipeg, the two teams met again for the first time since the incident, and some Jets fans decided to mark the occasion by encouraging people to wear helmets to the game. It was a great idea, and it quickly went viral. Pretty funny, right? Not to the Winnipeg Jets, apparently, because they stepped in and ruined the fun, even issuing a ridiculously formal statement. So much for that idea. You may now resume never ever thinking about the Winnipeg Jets. Earlier this week, we looked back at the career of Andre “Red Light” Racicot, the much-maligned Canadiens backup who wasn’t as bad as you remember, but whose reputation was destroyed by his (admittedly kind of awesome) nickname. But while Racicot was undoubtedly the most famous “Red Light” in NHL history, he wasn’t the only goalie to get saddled with the moniker. It’s been passed around for generations, and at one point was briefly hung on this week’s obscure player: journeyman goalie Vincent Riendeau. Riendeau was undrafted, but signed with Montreal in 1986. Like Racicot, his first NHL season involved exactly one game with the Canadiens. Unlike Racicot, that was the only game Riendeau would ever play for the Habs. He was traded to the Blues in 1989, then spent three years as a part-time starter in St. Louis before Curtis Joseph arrived and made him expendable. Riendeau’s two biggest highlights in St. Louis both involved the Red Wings: He gave up the first goal of Nicklas Lidstrom’s career, which was a memorable moment, and he once thought it would be a good idea to try to rat on Bob Probert, which I’m guessing he does not remember. Since he’d already given them so much joy, the Red Wings acquired Riendeau days into the 1991-92 season in exchange for Rick “Plants vs.” Zombo. He spent parts of three seasons in Detroit before being dealt to the Bruins, where he’d serve as a backup for the last two years of his NHL career. He bounced around Europe for six more years before retiring in 2001. Whether it’s Coach’s Corner, his regular media appearances, or a Twitter account that’s presumably meant to be performance art, Don Cherry is everywhere. What has he been up to this week? I don’t want to sound alarmist, but I think we’ve somehow entered the age of Bizarro Don Cherry. And I’m worried about what comes next. Will he pronounce Roberto Luongo’s name correctly? Get one of Ron MacLean’s segment-closing puns? Encourage kids to try to block shots with their sticks because what’s the worst that could happen? Reconcile with Hardy Astrom? Hold me, Don Cherry fans. I’m frightened. Americans rarely waste time panicking about their Olympic hockey team three months before the tournament starts. But they should. Look, we can all agree there are certain areas in which Americans can’t hold a candle to Canadians: Offensive firepower, blue-line depth, heart, grit, beer, sketch comedy, devastatingly handsome hockey writers … there’s really no need to go on. But as the 2014 Olympics draw near, there was one area in which Team USA was supposed to have a distinct advantage: goaltending. That was Canada’s obvious weak spot, while the Americans had an embarrassment of riches to choose from. Well, not so fast. Presumed starter Jonathan Quick has been just OK, and now he’s hurt. The big Tim Thomas comeback has been a disappointment so far. Craig Anderson is struggling. Jimmy Howard has been pretty good, but no more than pretty good. So who’s left? 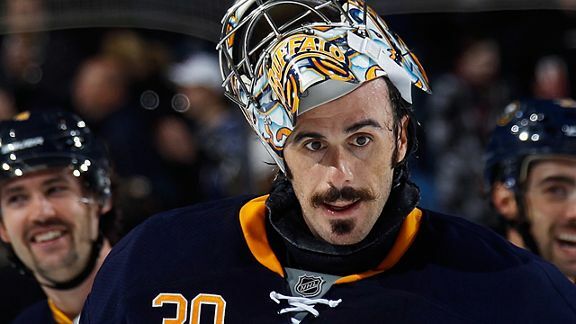 Ryan Miller is the obvious answer, and he has looked good under difficult circumstances in Buffalo. But do you really want to hand the reins to a guy who has only won four games all year, considering that winning gold will take at least that many wins in two weeks? Other than Miller, you’re looking at guys like Ben Bishop or Cory Schneider. Both are playing well, but would you trust them in an elimination game against Canada? After all, it’s not like Schneider has a great track record when it comes to sending Luongo packing. Maybe none of this matters. Quick could be back in January, put up a month’s worth of excellence, and roll into Sochi as the consensus pick. But for now, at least, it’s fun to watch another country panic over goaltending. You’re in a hockey pool, right? If so, this person is in the pool with you, and you hate them right now. This week’s hockey pool owner we all hate is whoever picked up Ben Scrivens on waivers right after Quick got hurt. Since that moment, here’s what Scrivens has done: won four games; recorded two shutouts; let the Devils win in overtime Thursday night because he felt sorry for them; read the complete works of Geoffrey Chaucer during the games; scored 15 goals; and built a time machine to go back to 1989 and beat Probert for the NHL’s heavyweight title. Ben Scrivens must be stopped. He’s ruining hockey pools in the same way that Wayne Gretzky did in the mid-’80s, when your dad’s office tried to implement the controversial “you have to draft Gretzky’s goals and assists as separate players rule” that caused his company to go bankrupt because of the lost productivity spent arguing about it. The lesson, as always: Fantasy pool waiver wires ruin everything. The Florida Panthers announced this week that they’ll honor former coach Roger Neilson by naming their press box after him. Neilson, a legendary innovator and Hall of Famer, was the first coach in franchise history. This week, we look back on one of his most memorable moments: the “White Flag” game. • The setup: It’s Game 2 of the 1982 Campbell Conference final between Chicago and Vancouver. Vancouver took Game 1 in double overtime, but Chicago is on the verge of evening the series. It’s leading 3-1 late in a game that has seen the Canucks take a steady stream of penalties and have a goal waved off. The Vancouver bench is not happy with the officials. They’re about to be even less happy. • Yes, I see a hand in the back. Is there a question? Ah, right. The answer is no. No, we are not going to talk about those Canucks uniforms. • Because if we start talking about those uniforms we’ll be here all day, that’s why. Some of us have weekend plans. Let’s all try to refocus and move on. • The puck finds its way back to the blue line, where current Sharks GM Doug Wilson feeds it across to Bob Murray. His point shot is deflected and FINE LET’S TALK ABOUT THE DAMN UNIFORMS. • So these would indeed be the infamous Vancouver Canuck “V” jerseys. (Yes, I said “infamous,” and I even used it correctly this time, comments section.) They were based on the work of a San Francisco design agency, and according to the Canucks website, “the bright orange was said to ‘evoke passion and aggression’ while the predominantly black road jersey would instill fear in the opposition.” Do you feel fearful? I feel something. I think it might be fearfulness. • To be honest, the whole “designing a uniform” thing has always been a bit of a weak spot for the Canucks. It might be best if we all just pretend we don’t notice so we don’t encourage them. • Back to Savard, who gets the puck back while standing alone in front of the net because this was 1982 and the New Jersey Devils hadn’t invented defense yet. He scores to ice the game, and after his oddly overdramatic celebration and several replays that feature that awesome thick yellow border every sports broadcast used back then, we get to the good stuff. • Our first hint that something is up comes around the 55-second mark, when several Blackhawks fans dressed as Chippendales dancers start pointing at the benches. • It’s good to see that one fan has brought a homemade “Na Na Hey Hey” sign, by the way. That’s probably much easier than just singing the song. Either that or this is an outtake from the worst Bob Dylan video ever. • And there’s Neilson, looking dapper in a classic early ’80s suit while stoically holding up a stick with a white towel on it in protest. He’s not waving it around. He doesn’t even look angry. Roger Neilson was a cool guy. He has a definite Richard Dawson vibe going here. • I love everything about this sentence from an NHL.com post about this game: “In protest, troublemaker Tiger Williams suggested to Neilson that he throw sticks on the ice, but Neilson, having already tried that, had a better idea.” He already tried that! Remember that the next time somebody tries to tell you that today’s league is out of control because somebody got mad and squirted a water bottle near someone. • The camera slowly zooms in on the towel, and I can’t decide which fan behind the bench to make fun of. Skinny Tie Guy? Trucker Hat Guy? Original Hipster Guy? Wearing a Raincoat Inside for Some Reason Guy? There’s too many of them; I’m overwhelmed. • Several Canucks join the protest. Check out no. 12, Vancouver legend Stan Smyl, who desperately wants to join in the fun but can’t figure out how to get a towel onto his stick. He and a trainer make multiple attempts to get it set up, but they can’t make it work. Focus, Stan, you can do this! • They all lower their towels at the exact same time. That always struck me as odd. Do we know for sure they didn’t get together before the game and rehearse this, just in case? • And it’s the ultra-rare coach ejection! These are invariably fantastic, especially when they involve a long walk across the ice. There’s always that fascinating subtext: Sure, he’s been ejected, but he could also wipe out and crack his head open on live television. • I like how Smyl and Williams accompany Neilson without actually helping him. Are they concerned he may get lost? Were they worried he might take a wrong turn and end up awkwardly wandering around the defensive zone for the rest of the game? • And there goes Neilson, down that flight of stairs that led to the visitors’ dressing room at the old Chicago Stadium. That’s some strong building design right there. “Sure, let’s make the other team walk up and down a flight of stairs while wearing skates several times a game, what could possibly go wrong?” I miss those stairs so much. Here’s a clip of the time a fed-up linesman committed attempted murder by trying to throw Rob Pearson down them. The Canucks lost the game, but “Towel Power” instantly became a rallying cry. Vancouver fans showed up at Game 3 with white towels of their own, and to this day they’re still a franchise tradition. They worked, too — the Canucks swept the rest of the series and made the first trip to the Stanley Cup finals in franchise history. But their magic ran out in the final, when they were swept by the New York Islanders dynasty. To add insult to injury, the Islanders vowed they would someday also shatter the 1982 Canucks’ record for ugliest uniforms. Dysfunction Junction: How Have the Cavs, Wizards, Knicks, and Nets Fared Since Their Players-Only Meetings?